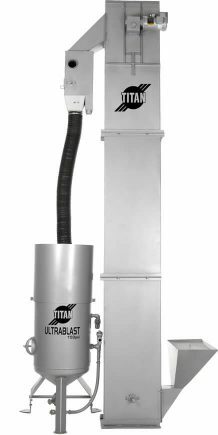 Titan Mechanical Reclaim Systems come complete with bucket elevator, air-wash separator, and vibrating screen. Depending on your needs, the system can be configured with one or two media blast machines, or as a stand-alone unit to use with your existing blast pot. Titan bucket elevators process up to 200 cubic feet per hour of dense and coarse media, such as steel grit and steel shot. Our hopper and bucket elevator recovery systems can be flush mounted for easy loading by placing the elevator and hopper in a small pit. If a high water table is a concern, the system can also be wall-mounted and shovel fed. The addition of a screw conveyor to replace the hopper is available as an option (see details below). Titan screw conveyor, or auger, recovery systems are designed primarily for use with steel grit and steel shot and require the use of a bucket elevator. Our screw conveyors are available in several different lengths and configurations to meet your demands. Because screw conveyers are most often used with steel grit and shot blasting, most screw conveyors are mounted in a pit so the heavy media can be pushed into them with skid loaders or other methods.